Guest lecture on ‘Mesenchymal stem cells as cell based therapeutics- A journey from hype to hope’ on December 12, 2016. The Life science Association had organized a guest lecture on stem cells which gave insight into how mesenchymal cells from donor can be used for regenerative medicinal purposes, autoimmune diseases, pathogenic infection and type1 diabetes. The speaker was Dr Jyothi Prasanna, Associate professor, School of regenerative medicine from Manipal University. 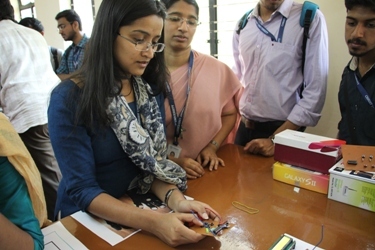 It was organized on 4.12.2015 in Room No.13 of Block I. Dr Jyoti also highlighted on courses offered by Manipal University on Regenerative Medicine and the prospects of this field in the near future in the field of medicine. The Department of Life science organized talk by Dr. Dipshika Chakrabortty, Department of Microbiology and Cell biology, IISc, Bengaluru on 31.01.2016 in Room no. 911 of Central block. She talked about the past, present and future of microbiology. The success stories of eminent microbiologists were shared with first years. She also talked about the importance of understanding the history rather than memorising it as it helps in appreciating the contribution of the scientists and inspires us to be innovative. 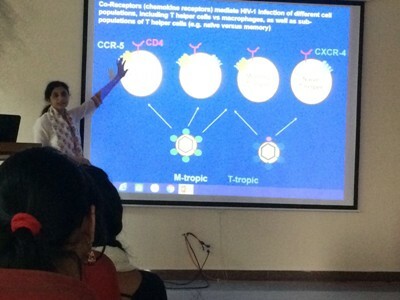 Guest lecture on ‘Cellular Immune Mechanism- Future of HIV-TB confection research in India’ on February 2, 2016 by Dr. Annapoorna V, King’s college, London. The Life Science Association organized a guest lecture by a faculty from King’s College, London on the topic of HIV-TB connection. The resource person was Dr. Annapoorna V, Senior Professor, school of Medicine, King’s college, London. Thwe talk was held on 2.02.2016 in Room no. 105 of Central Block. She gave an overview of the global crisis associated with HIV and how the treatment is very problematic given the cellular mechanism followed by the virus. 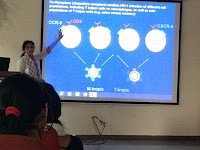 She also spoke about the infection mechanism and the involvement of CCR5 receptor in the disease. The co-infection occurs due to the fact that HIV infects TB specific cells. It was a very informative talk. The Science Forum under the Deanery of Science organized a Science exhibition on February 24, 2016. Undergraduate and postgraduate students from the different departments under the deanery of Science actively participated in the exhibition. 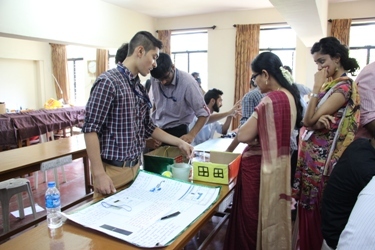 Preliminary screenings were conducted in each department and the six final teams were allowed to participate in the finals by putting up their exhibits in the stalls. 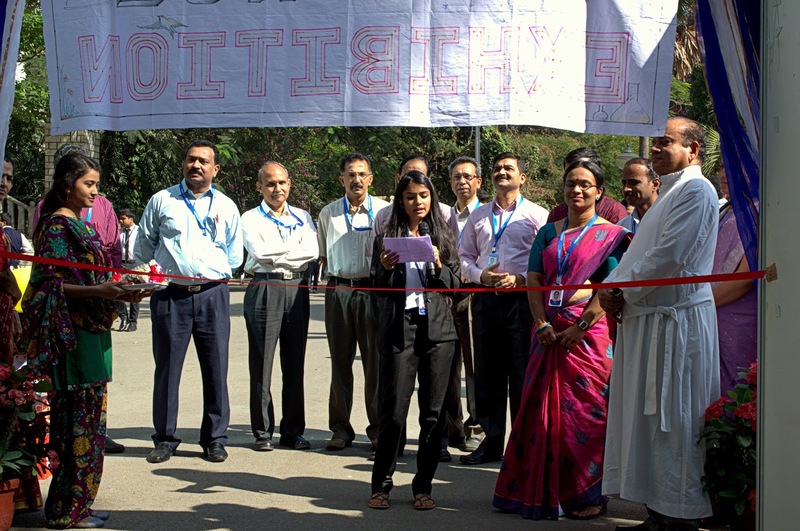 The exhibition was inaugurated by the Honorable Vice Chancellor of Christ University, Fr Dr Thomas C Mathew. 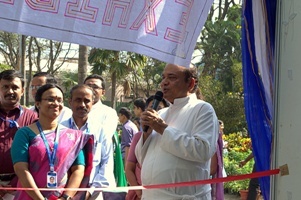 The Dean of Science Dr Nanje Gowda N M, Associate Deans, Dr Louis George and Dr George Thomas, Personnel Officer Prof Chandrasekharan K A, Science Forum Coordinator Dr Suma S, and the HODs of various Science departments were present for the inauguration. 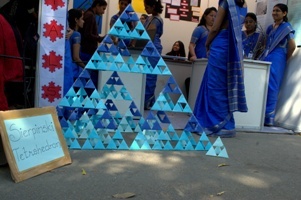 There were a total of 15 stalls where the students of the seven departments- Chemistry, Computer Science, Electronics, Life Science, Mathematics, Physics and Statistics – showcased their talents. Three teams from each stall were given cash prizes as motivation. The creative talents of students were revealed during the exhibition. 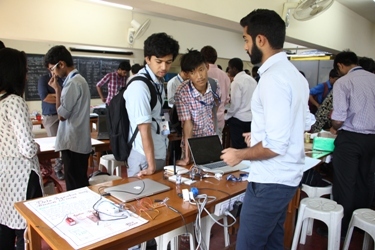 The Annual Exhibition of Electronics Projects was organized by the Electronics Club on Friday, 19 Feb 2016 in the Electronics Lab, Block1 from 12 to 2pm. The final year students of VI SEM B.Sc. PME and CME participated with their working projects. This exhibition was a part of the lab work for practical paper ELE 652. The Students completed the projects under the guidance of faculty members of the department. 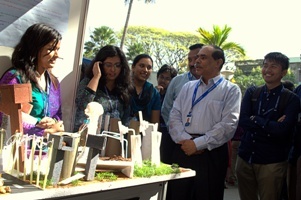 They demonstrated the working of their projects using charts, models and power point presentation to the visitors. There were about 30 teams in the exhibition. The participating teams came out with various applications of Electronics in the form of their project like, Security access control, vehicle density based smart traffic light controller, synchronized robotic arm, prepaid electricity meter, Android App based home automation, Bluetooth controlled message display, solar powered plant pot, smart irrigation system, RF and DTMF controlled robotic vehicles, etc. The students from junior classes visited the exhibition and interacted with the exhibiting teams. There were students also from other combinations and streams.